Get Excited Kayakers! So kayaking the whitewater rapids in Columbus, GA just has too many hassles. Now Kayak Columbus is here to ease those burdens. Are you ready to experience more than just the wave shaper? Enjoy the full 2.5 miles of rapids by using our shuttle service. There are several great rapids and play holes at the start of the rapids that get you warmed up for The Good Wave and Cut Bait. And of course you don't like getting your car seats wet after your paddle. We don't mind at all when you get our shuttle bus seats wet. Need a place to store your kayak? Use our 6000 sq.ft. storage facility. We have changing rooms to shed your city clothes and put on your kayaking gear; and vice versa. It's just too easy to prep and load up your gear at our facility. 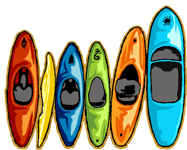 Meet your kayaking friends here and make new friends too. Are you tired of trying to find a parking spot downtown? We have ample parking. ALWAYS FREE. And we're not too far from the river. Just a 5 minute drive to the access points or less. So kayakers, use our shuttle and storage services and get more excitement out of the rapids. And if you're not a kayaker, now is a great time get into the sport. Purchase your kayak and gear from our friends at The Outside World and let us serve you. "Remove the hassles kayakers face off the water so they can spend more time on the water." Our services aren't just for the whitewater kayakers. We also store flatwater and fishing kayaks too. So free up more space at your home and store it with us. What works best for kayakers is to park near the water tower somewhere near 12th Street and Bay Avenue, we pick you up there and shuttle you and your gear to the North Highlands Dam. The end of the rapids is right there close to where you parked. Parking in the Bay Avenue Parking Deck is free on the weekends.